Homemade Sushi is so much cheaper than at the restaurant. 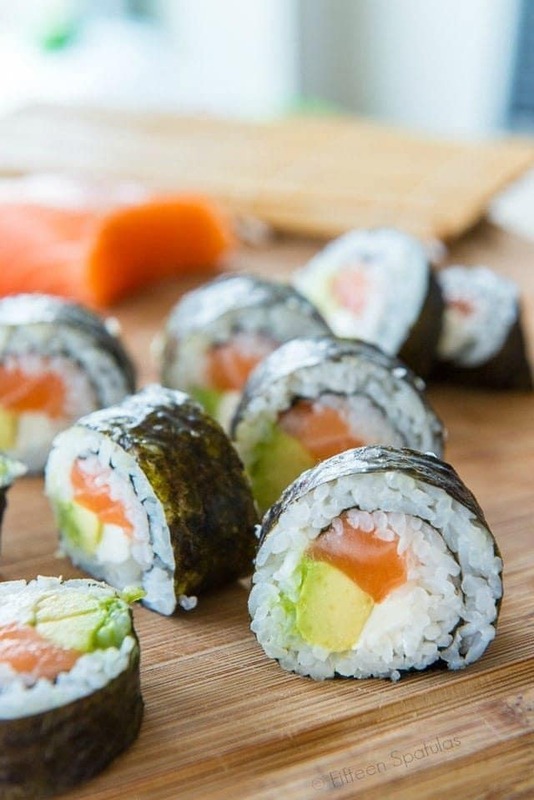 Sushi is easy and fun to make at home, and you can put all your favorite ingredients into your perfect custom roll — here’s how! I’ll be very honest and say that there’s definitely a reason why chefs spend a decade learning how to perfect sushi rice or cut raw fish like a boss, because it does make a difference. You get to gorge yourself on a sushi FEAST for like $20, whereas a similar amount of sushi at a restaurant would cost a couple hundred. Soooooo worth it, if you ask me. And you know what else? Sushi is really fun to make at home. My husband and I first made it several years ago for Valentine’s Day as a way to avoid the restaurant craze and spend time together making a special meal, and now it has become a tradition for us every year. And we love it so much we can’t limit it to one day a year anymore, and make it on occasion for dinner. We are fortunate to have access to sushi grade raw fish, but you can still make sushi at home if you can’t find some. Shrimp tempura rolls are one of my favorites, or you could do a California roll or a veggie roll. One of our favorites is a Philly roll, with smoked salmon, cream cheese, avocado, and cucumber. 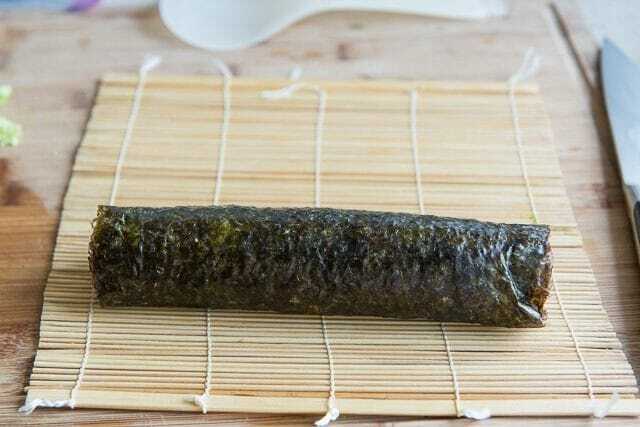 Or if you want to try something a little different, you can make Korean Kim Bap. It’s fairly similar to sushi, but no raw fish. 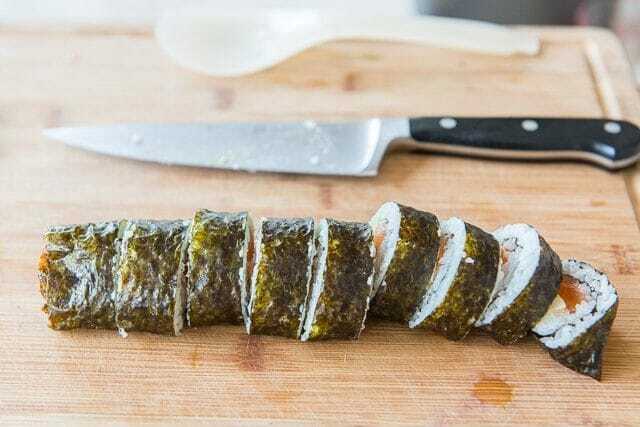 What seaweed should you use for sushi recipes? To get started, you need the right kind of seaweed. The one on the left below is thick and perfect for rolling sushi (this is the one I use). The one on the right is too flimsy. I use that seaweed for snacking. 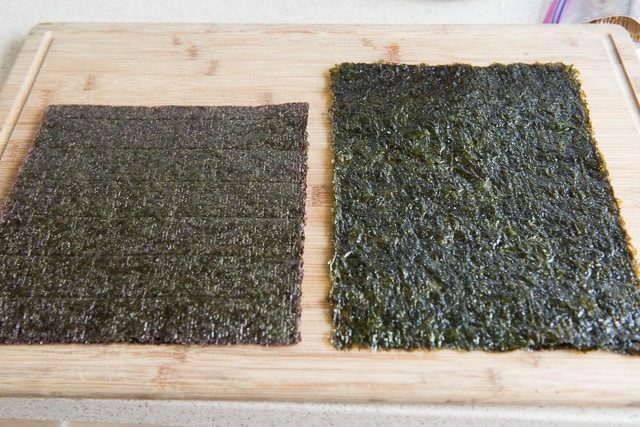 Make sure you get seaweed specific for sushi-making, which it should state on the package. 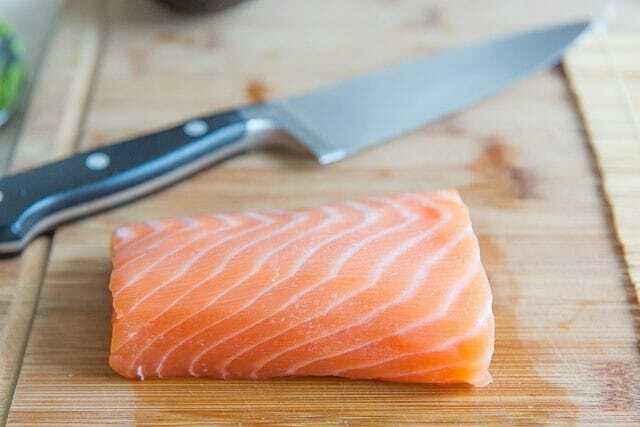 For my sushi this time, I got this gorgeous piece of salmon. It was a 1/2lb piece, and gave us enough fish for about 6 rolls, plus some snacking. Even at $28/lb, which seems like a lot, paying $14 for that much fish is certainly worth it, and dirt cheap if you ask me! Roll it up tightly, using a bamboo mat. It’s a specific kitchen item, but you can get a decent one for less than $2 on Amazon, so I think it’s worth having. 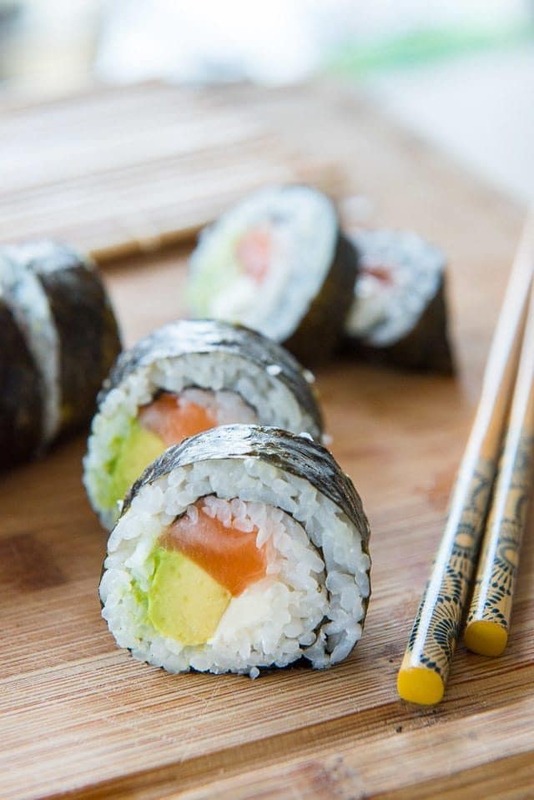 If you don’t have one, you can sort of use parchment paper or plastic wrap, but you won’t be able to wrap it as tightly, so buy one if you plan to make sushi regularly. 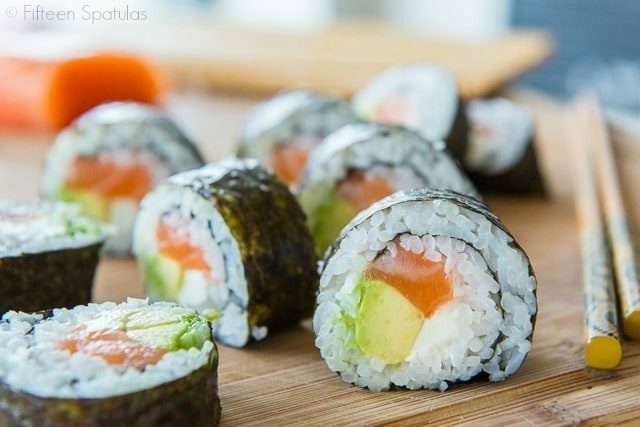 Then use a sharp knife to cut the sushi roll into pieces. I don’t find it particularly better to use a serrated knife. Just make sure to use a sharp one! What to serve with your sushi? Now you’re ready to eat the rolls with some soy sauce, pickled ginger, and wasabi, as desired! Next try Honey Walnut Shrimp or Seared Scallops for a special seafood dinner at home. Can you keep sushi overnight? 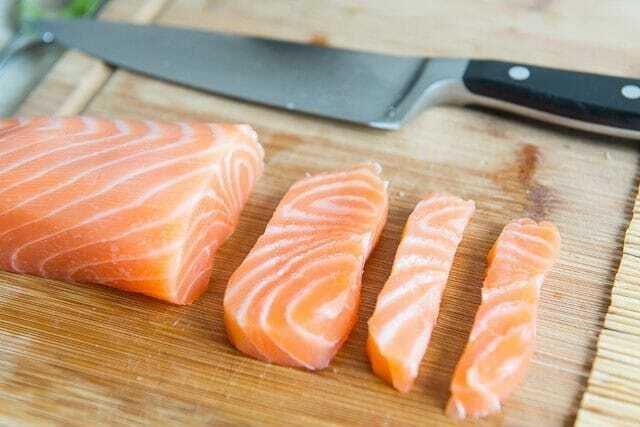 I don’t recommend this, as the longer you keep the raw fish, you risk bacteria growth and illness. If I find that we’re getting full and we still have ingredients left, we’ll usually just enjoy the rest of the fish, thinly sliced sashimi-style, because that’s the most valuable part, and let the rest of the ingredients go. Also, refrigerated rice gets hard and dry, and doesn’t reheat well, so sushi is something that should be eaten freshly made. Can you make sushi without fish? Yes, you can do vegetarian and even vegan sushi recipes. There are tons of ideas online, but avocado, cucumbers, and carrots are great filler ingredients. 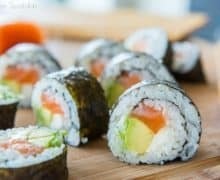 Easy rice cooker sushi rice: Sushi rice is an art that chefs spend years perfecting, but if you’re looking for something easy, I have a post on how to make sushi rice in the rice cooker. Homemade Sushi is so much cheaper than at the restaurant! 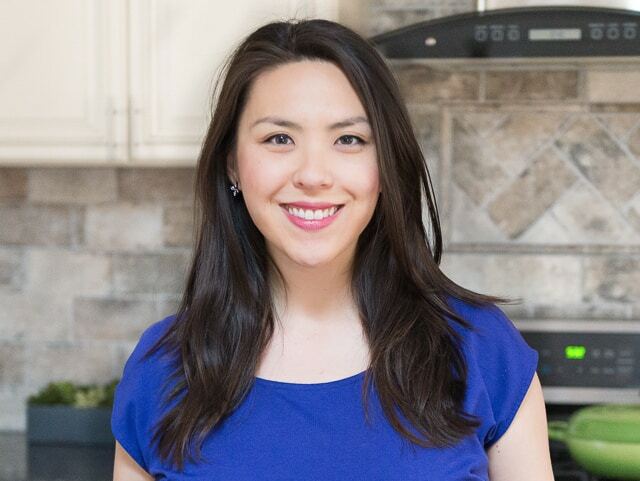 Sushi is easy and fun to make at home — here’s how! 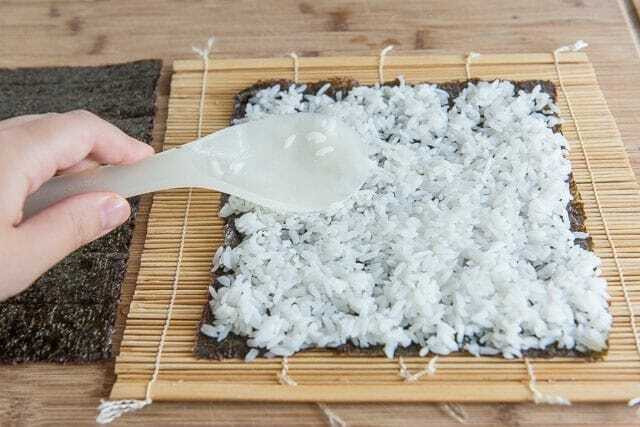 Place the seaweed on a bamboo mat, then cover the sheet of seaweed with an even layer of prepared sushi rice. Smooth gently with the rice paddle. 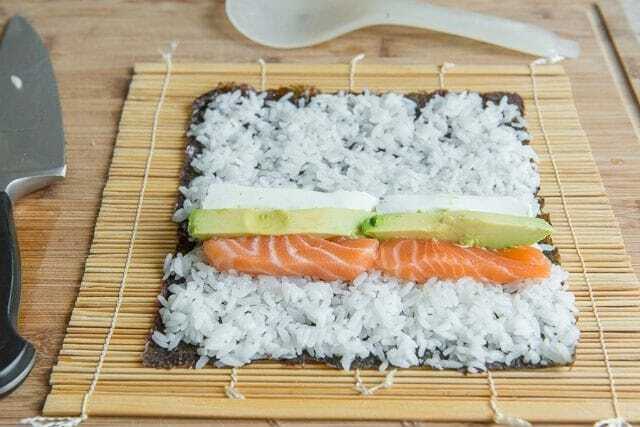 Layer salmon, cream cheese, and avocado on the rice, and roll it up tightly. Slice with a sharp knife, and enjoy with soy sauce. Thanks for all the tips! Mine turned out wonderfully! I will use smoked salmon next so my hubby can indulge. So much fun to make at home! Thanks for this! This is perfect- we love to make sushi at home! 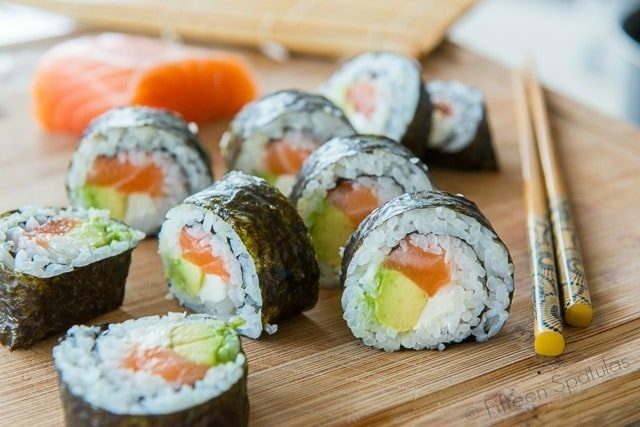 Amazing sushi! Very easy to make and fun for the kids.